A UNESCO report identifies World Heritage sites at risk from climate change, but there is no mention of Australian sites in the report. The Australian Government requested that all mentions be deleted, and this was complied with by UNESCO. This censorship of science should raise many questions. "Last year I was asked to review an international scientific report on the impacts of climate change on World Heritage sites and tourism. I reviewed a case study on the Great Barrier Reef, focussing on the increasing risks to tourism from climate change. As a scientist, I’m angry. As an Australian, I’m disgusted. As a Climate Councillor, I’m now asking for your help. Today you will hear me on the TV and radio waves as we ask the government to answer these allegations, which are deeply troubling. "The department was concerned that the framing of the report confused two issues – the world heritage status of the sites and risks arising from climate change and tourism. It is the world heritage committee, not its secretariat (the World Heritage Centre), which is properly charged with examining the status of world heritage sites. Recent experience in Australia had shown that negative commentary about the status of world heritage properties impacted on tourism." "The department indicated it did not support any of Australia’s world heritage properties being included in such a publication for the reasons outlined above." According to the Department, communicating this to UNESCO was charged to Australia's UNESCO ambassador, currently Mr George Mina, a senior career officer of the Australian Department of Foreign Affairs and Trade. The Department also stated that Minister Hunt was not briefed as part of this decision. The author of the censored chapter on the Great Barrier Reef, Mr Adam Markham, is the deputy director of the Climate and Energy Program at Union of Concerned Scientists. He told the ABC that what was removed was important work. "I think it was a pretty fair and balanced piece of work and so it tells us that in fact it's one of best managed World Heritage Sites in world, there's an awful lot of science going on in the Great Barrier Reef," he said. "We wrote it before this current bleaching event and that obviously is catastrophic at the moment for the barrier reef, it's one of the worst bleaching events they've seen." "So we didn't have any knowledge about of that at that time because it hadn't happened, but the case study that we had in there gave a very good description of the history, the management, some of the problems facing it and identified climate changes as one of the major risks that we have to deal with if we want to prevent the reef degrading." 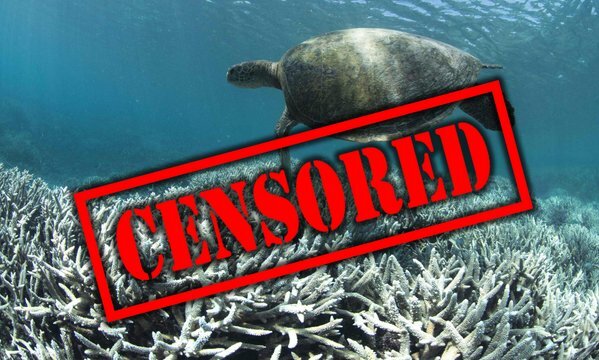 Both Mark Butler, Labor's shadow Minister for the Environment, and Larissa Waters, The Greens Deputy Leader and spokeperson on climate change were scathing in how a UNESCO report could be censored by the Australian Government. “Report after report, expert after expert, tells us that the biggest threat to the Great Barrier Reef is climate change,” Butler said. “How could UNESCO miss this? They didn’t — the government made sure it was left out,” he said. “This is one of the Seven Natural Wonders of the World and we have a responsibility to act to restore its health and resilience,” the shadow minister said. “What we don’t need is a government that won’t act on climate change and won’t allocate any new funds to protect the reef. "The best way to help the reef and to boost tourism and economic growth is to take serious action on climate change, to face the challenge and show leadership. Hiding from the problem will do nothing but damage the reef further. “Malcolm Turnbull needs to front up and tell us exactly what he has done to hide the truth and why. Labor has a serious plan for tackling climate change. Under the last Labor government emissions fell, but they are up under the Liberals’ useless, expensive direct action policy. "The Turnbull Government will stop at nothing to cover up the devastating impact its inaction on global warming is having on our World Heritage Areas like the Great Barrier Reef and our magnificent Tassie Wilderness. The solution for saving the Reef and for saving the tourism industry it supports are one in the same. "We need a healthy Reef for a healthy tourism industry and that means actually dealing with global warming, rather than ignoring it. "I am calling on Minister Hunt to publicly explain his role in this sorry affair including whether he was aware of the censorship before the report was published regardless of whether he was formally briefed by the Department. The old parties are adding more fuel to the fire by allowing millions more tonnes of coal to be dug up and shipped out through the Reef to further cook its waters when burnt. "We Greens have the courage and vision to act on global warming by transitioning to clean energy to save Reef tourism jobs while providing new jobs and training for coal workers already being sacked in this dying industry," Senator Waters said. Greg Hunt had an opportunity to defend the decision at The Project current affairs program: Climate Report censored?. He wasn't very convincing. Hunt posted this tweet lauding the fact that after substantial lobbying the Great Barrier Reef world heritage site was taken off the In-Danger list. Australia made the international news for this censorship with reports at The Independent and the BBC in the UK and at the New York Times. There was also some satire from the Backburner at SBS comedy: Great Barrier Reef Removed From UN Report To Accurately Reflect Future. Clearly other nations didn't have the same view with regard to impacts on Tourism. Professor Tim Stephens tweeted "Clearly the Italian govt didn&'t demand that Venice be removed, despite the #climate risk to tourism #reefgate" Stephens is Professor of International Law and an ARC Future Fellow at the Faculty of Law, University of Sydney. He is also President of the Australian and New Zealand Society of International Law. Matthew Rimmer, a Professor of IP & Innovation Law at the Queensland University of Technology, raises some interesting questions and implications including the scientific integrity at UNESCO to allow censorship of science at this scale to happen. Rimmer tweeted that "ReefGate is an international relations story as well - as the head of UNESCO is a candidate to be the UN Secretary-General." and that "The Director-General Irina Bokova has much to explain over climate science censorship in UNESCO report". He asks, "How will UNESCO chief Irina Bokova's push to be UN Secretary General be affected by the Reefgate scandal?" Bill Hare from Climate Analytics also raised the integrity of UNESCO in accepting the censorship of it's report, tweeting "Climate council is right, climate scientists stunned, shocked. 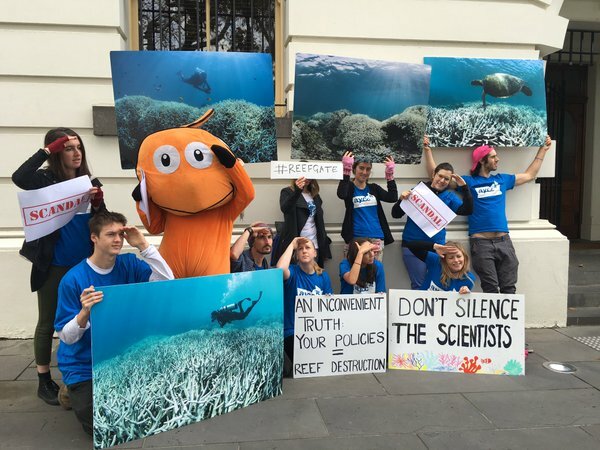 ReefGate challenges scientific integrity at UNESCO". The Australian Youth Climate Coalition (AYCC) organised a snap action: "We're on the hunt for the truth at the Commonwealth offices. Why did the govt delete the chapters?" they tweeted. The Coalition Government are planning to review climate policy in 2017. That is when The baseline and credit scheme may be ramped up. But really it is too little too late. Australia's 5% target by 2020 will only be met through use of Kyoto Protocol phase one credits - an accounting trick. Australia's emissions are rising and currently not expected to peak before 2030. That is a worse achievement than China. Our 2030 targets of 26-28% are not compatible with the 2 degrees target enshrined in the Paris Agreement but are more aligned with 4-5 degrees of warming. The Great Barrier Reef was literally 93 percent cooked this year, and likely to see mortality rate of 50 percent of affected corals. It urgently needs a $10 billion investment for a chance at survival. Projections are that by 2034 these marine heatwaves will be a regular occurrence striking nearly every year. In 30 years time I am betting coral reef ecosystems will likely be dead unless we rapidly reduce emissions. The damage comes not just from marine heatwaves, but the increasing ocean acidification that is reducing coral ability to grow and recover, and increasing nutrient and sediment pollution from Queensland agriculture. While Hunt lauds his multi-million dollar programs to increase water quality, Turnbull is promising a $150 million Queensland dam bonanza which will actually increase agricultural nutrient pollution. The reef is in the middle quietly being destroyed through this policy dissonance.